Tonight's the night for the first barbecue of the year! 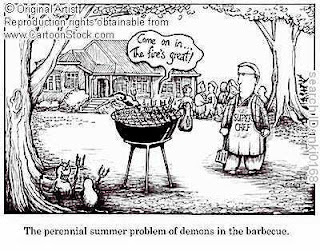 It's been so mild here today - 23°C that even a reluctant barbecuer such as me cannot resist the call of the grill. Being a seasonal cook, however, I can't yet indulge in the joys of aubergines and other summer veg. Actually, by the end of summer I'm usually sick of them all so it's good practice to stave off the temptation to dash out and buy them before they're ready here. I've emptied out the barbecue and let it dry in the sun. It was a rust bucket of vile charcoaly water, with even more foul metal grill so I've scrubbed that to kingdom come too. I believe I can now put food on it without imperilling life and stomach. Mind you, 20mins in close contact with a raging inferno would probably kill off anything that might be lurking there too, but it wouldn't remove the black coat of ancient grease from the last barbecue of the previous year. I've got steak marinading in the fridge, sat in olive oil, wine vinegar, soy sauce and garlic. I've prepared some totally wicked garlic bread - not too much however or we'll be obliged to live off Danacol for the next month. There are some sausages from the local butcher, homemade barbecue sauce (basically olive oil, tomato ketchup and Branston pickle plus extras), salad, and some tomatoes for grilling with herbs. This is a special treat for my TWDB (Totally Wonderful Dearly Beloved) and me because it's the first day of the Easter holidays and I am child-free for two weeks! I've thus got two bottles of rosé cooling in the fridge. On the down side, the pollen season is upon us. When I cleaned the table on the terrasse, I wiped up a ton of yellow powder from the pines. I'm not allergic to it, thank goodness, or I'd be sitting here with my eyes streaming, and sneezing every third second. I just hope he isn't too or we'll be eating inside.